Of all of the bridges we encounter on a daily basis, both figurative and literal, the one between our brain and the rest of our body seems fairly important. Protecting that structure is enjoying a renewed focus and Iron Neck is at the forefront of that movement. On today’s podcast, our host spoke with the CEO of Iron Neck, Matthew Schmit. 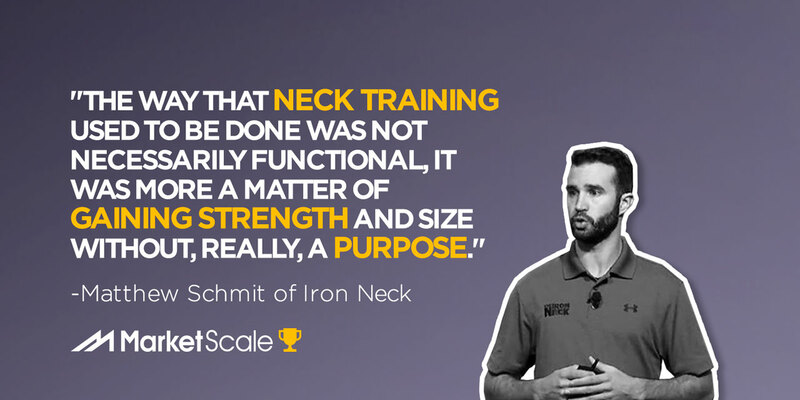 “The way that neck training used to be done was not necessarily functional, it was more a matter of gaining strength and size without, really, a purpose,” Schmit said. We discussed the drive behind the innovation, the focus on pricing, why it took so long to bring awareness to the challenge, and how the design of Iron Neck can be applied to other parts of the body. SH: One of the really weird sort of historical facts about Iron Neck is that the problem that you’re solving, the issue that you’re addressing used to have somewhat of a solution or at least people paid attention to the challenge of neck strength and then for some reason it just sort of faded out of consciousness. Why did that happen to make Iron Neck necessary in the first place? Matthew Schmit: That’s a good question. I travel to a lot of coaching clinics and conferences throughout the year, probably 20 to 30 a year all around the country and I get that a lot from coaches. They'll say, “Hey, when I used to be playing football, we would train the neck every day and then it just went away,” like you said. And nobody really knows why. I think a big part of it is training became a little bit more functional and the way that neck training used to be done was not necessarily functional. It was more a matter of gaining strength and size without, really, a purpose. So when CTE and concussions sort of intertwined around 2010 to 2012, and there was some early research being done around neck strength as a way to reduce concussion risk, there became a purpose for neck strength and Mike Jolly invented Iron Neck around that time. And now as more information is gathered and available to coaches and athletic trainers and athletic directors and parents and athletes, people are actively seeking out ways to strengthen their neck as a preventative way or proactive way to reduce their risk of concussion. SH: Now I don’t want to sound like a smart-aleck, but it seems that we could all agree as the thing that connects your head to the rest of your body, the neck is pretty important. I think we can all agree on that. SH: You’ve always had a focus on making sure that the people who can benefit the most from this can actually get their hands on it. You guys took another step to make it even more available to weekend warriors so to speak. Talk to me about that development. MS: Over the past couple of years, we’ve made a lot of improvements to the Iron Neck design, its comfort, its usability and the price. Two years ago, we had one Iron Neck model, one size, and it was $825 for a bundle. Now we have options ranging from $325 to $625. SH: That’s not a crazy price when you look at all of the other equipment in the sporting world, that was a good price to begin with, but you made it even better. MS: Yeah. I think it’s a fair price especially when compared to what the previous gold standard was in neck strengthening and that was a four-way neck machine. It’s hard to get a four-way neck machine today for less than a thousand dollars and the nice ones that the bigger companies make are $3,000 plus. But we wanted to make it available to schools and to some people that weren’t already actively strengthening the neck and we knew that it had to be efficient and the way that it’s efficient with a hundred athletes in a weight room at a time is you can’t have a bottleneck. So you’ve got to have a few of these things in order to get kids or athletes through efficiently. And so we set our sights on some retail prices, targets, and we worked to get our cost down and then pass those savings on to the customer. And then your question was, “What was the recent step that we had just taken?” And that was introducing an Iron Neck Home model. And so now we’ve got a Home, a Varsity and a Pro model. SH: What is the difference between the three models? MS: They all work the same through the linear or horizontal resistance. You put the Iron Neck on your head, you attach a resistance band or a cable pulley to the Iron Neck truck, a device that rotates around the circular track, and you load a linear load. With the resistance band, you just step back depending on how much resistance you want; With the cable pulley machine, you set the weight on a weight stack. Where the three models are different is in the rotational resistance. So you can imagine rotational resistance by putting your hand against your temple and trying to rotate your head through your hand. And as you apply pressure with your hand, you’re applying rotational resistance. That’s what the Iron Neck does in a rotational resistance capacity. So you’re able to train incessantly through rotation. Our Pro model has the ability to adjust from no rotational resistance all the way to the point where that track is locked down on the track inputs. In our Varsity model, which is great for high schools that need a few of these things or colleges that need a few but don’t have the funds to buy the Pro model in bulk, the Varsity model has a fixed amount of rotational resistant. It’s just not adjustable. And our Home model, as you said, is more for your weekend warrior or your desk worker or anybody that’s rehabbing, neck posture, limited mobility in the neck, spine issues, because it’s a great core training device as well since the lever point is at the top of the body. The Iron Neck Home is great for somebody that wants access to this tool, but doesn’t necessarily need the rotational resistance which again is important for athletes because there’s a rotational force acceleration component of concussions. But for just average you and me, we’re not exposing ourselves to significant rotational force acceleration. What we’re looking for is stability and strength in the neck and core and then mobility as we rotate our head and move around our spine. SH: Because the physical concept that you’ve come up with, the rotational resistance, those are basic sound concepts of physics. Can you apply those anywhere else? MS: Yeah. We’ve actually got a couple of things in the pipeline. That’s a great observation. So the Iron Neck obviously works from the neck down. It’s worn around the forehead, just above the ears, all the way around the head, the full circumference of the head. It’s working the neck down through the spine and work in core that you got to resist from the neck down. A couple of things that we’ve got in the pipeline is a product right now we’ve dubbed Rev Trainer and it’s going to be worn around the waist. So you’ll be able to run with this, you’ll be able to jump with this thing on, and you’ll be able to use this in rehab setting. So couple different applications that we’ve got our sights set on for the Rev Trainer is obviously rehabilitation, anybody that is rehabbing a lower extremity injury, so ACLs, ankle injuries, anything in the legs, perhaps even the hips. Athletic performance is another segment. So you see right now sprinters working with parachutes or dragging a sled. It’s very difficult for them though to change direction so going from a sprint to a back pedal. Right now you can’t really do that because there’s not a track system where you can rotate the body and then accelerate. The Rev Trainer would solve that. So it’s a similar design and concept to the Iron Neck, obviously wore around the waist, and it’s got that track system so you can run in any direction and it’s always going to have the same line of pull. A third segment that we’re really excited about is group fitness classes. So there are a lot of group fitness classes available right now, take Reebok step class or a Zumba class for example. You can combine those types of classes with some linear resistance and just exemplify the training that you’re trying to accomplish. SH: You know, one of the biggest struggles for anybody working out is you can work out the right way, but you can also work out the wrong way. You can lift a weight with incorrect elbow position and you actually do more damage than you do good. You need a finite imaginary track or repeatable move. For example free weights, there’s so much discipline that has to go into that. You have to learn the exact form in order to not injure yourself. One of the interesting things I see in Iron Neck is it’s almost impossible to use it incorrectly because of the way it’s designed, it only allows you to do it the right way, the right movement without over rotation or under rotation or it’s really a way to remove that fear of injury that is… the fear of injury, the fear of CTE is probably something that’s causing these sports participation to drop. And rightfully so, I mean obviously we want our kids to be safe. But if they could train in a safe procedure like the Iron Neck provides or like you’re going to have as part of the Rev Trainer, isn’t that just the common sense way to approach this? How come that’s not the standard? How you come guys are the ones that are having to say, “Hey, look, this is the logical way to do this”? MS: Well, I think that’s a great question. There’s a lot that goes into it. So number one, working with and training the neck is scary to a lot of people. Even if you’re hurt, you avoid going to a physical therapist, you avoid going to a chiropractor, you avoid doing anything for fear that it might make it worse. And I appreciate what you said that it’s hard to use Iron Neck incorrectly. There are certainly ways that you could use it a little less efficiently, a little less fluidly as you’re going through the different movements and we put this thing on and just move around. You’ve got horizontal resistance pulling you, you are training the muscles opposite, the side of the pole down from the neck down to the spine and the core. So it’s hard to use it incorrectly as you said. But there is a little bit of a learning curve for certain individuals kind of get this on and just perform the movements as efficiently and fluidly as possible. And then the youth sports, yeah, there’s definitely been a trend over the past decade of youth sports participation going down. It’s not at a significantly critical level right now, but it is a trend and everybody involved from the organization standpoint, I’m talking about high schools or colleges or sports organizations domestically and internationally. They’re looking at ways that can make the game safer, make equipment better, and provide more safety to the athletes, and then there’s a diagnostic and recognition aspect where you want to be able to quickly recognize when somebody is injured, whether that’s a concussion or any other type of injury and that has advanced over the past decade and then what we do in the preventative maintenance of the body. MS: So we’re trying to build safer athletes in the weight room ahead of time before they get out on the field or on the mat or on the court or on the slopes so that they’ve got the chance to prepare their body for the rigors of sports ahead of time. And over the past five or ten years, there’s been a mounting amount. There’s been mounting research showing that next strengthening has a relationship on concussion risk. There’s a study that came out in 2014. It monitored 6,700 high school kids, boys and girls, across basketball, lacrosse, and soccer for two and a half years and they measured neck size and neck strength at the beginning of the study and then monitored all the kids for concussions during that two and half year period. And what they found when they analyzed all the data at the end of the study was that for every one pound increase in neck strength, odds of concussion decrease 5 percent. Now adding one pound of neck strength is nothing. That can be done in a week using Iron Neck or many other devices. Iron Neck again, it allows you to train functionally, increases strength, and mobility, which sets it apart from other devices and other modes of training.